Well, not sure that the two actually DO go together but “Cincinnati Bengals, Steelers” is DESTINED to be a great “Google search phrase combo” today!!!! (Bring on the blog hits!) In the meantime, we saw the car above driving through the Strip District the other week. I nearly fell out of my heated, power lumbar support, multi-position driver’s seat. Clearly, this poor tortured soul either lost a ridiculous bet OR is repenting for some terrible, terrible sins and has a very creative and vindictive Roman Catholic pastor. Put it THIS way, we can’t think of any other REASONABLE excuse for riding around Pittsburgh with that bumper sticker on a car!!!! The good news is, if this person really DOES love Cleveland, we found a home for his/her poor tortured soul. The pic below is from the Cleveland Browns pre-game tailgates yesterday…..actual photo from a Twitter fan who is now officially designated as our Cleveland Jagoff Correspondent due to his AWESOME phone-photo-journalism capabilities! You can’t see THAT many open spaces at a Steelers pregame tailgate even at Noon when there’s an 8pm game start!! 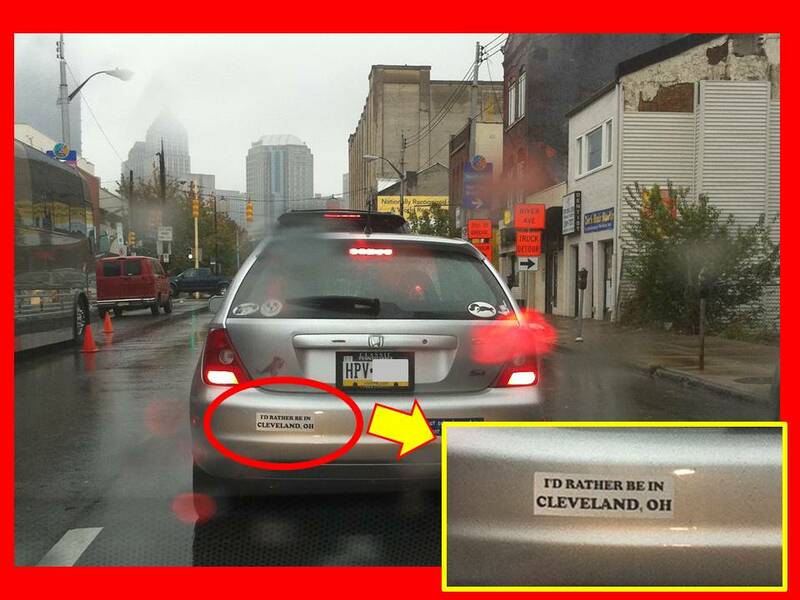 There’s certainly plenty of room for this Cleveland-lover and his I-have-LOTS-to-say-with-all-of-my-bumper-stickers car. We say, if you have THAT much to say, get a Twitter Account. Also, feel free to saddle up, hop on the Turnpike and GO WEST YOUNG MAN!!!! The PA Turnpike is actually FREE to the Ohio Line and then you can barter with buckeyes for the rest! In the meantime, let’s give this driver the benefit of the doubt and say they may have bought this car USED and these stickers just happened to be on it from the previous owner. In THAT case we say, it’s probably WELL worth it to rip your whole damn bumper off the car than to drive around Pittsburgh with THAT bumper sticker, Ya Jagoff!!! Thanks to Honorary Jagoff Catcher and Twitter Follower @newshutr for the Cleveland Pics! !